It’s that time of year. With these cold temps, you’re stuck indoors. The kids are busy with school activities and homework. Work is hectic. Life is moving fast and you’re finding less time to slow down and enjoy it. An organized home will help you handle it all with ease. As you begin to tackle your home organization, the kitchen is the best place to start. The kitchen is often the hub for the family. It’s where the kids drop their school bags as they grab a snack after school. The mail ends up on the table waiting for somebody to filter through it. Electronics clutter up counters as they charge near outlets. Sparsely used appliances litter counter tops. It’s hard to get anything accomplished when you’re battling clutter and disorganization so let’s take some steps to get it all under control. Unclutter your kitchen and get organized. Step 1: Purge! Over the years, you’ve likely accumulated a lot of stuff; small appliances, kitchen tools, a junk drawer filled with random birthday candles, recipes, magazine clippings, and batteries. It’s time to get organized and get rid of some of that stuff. Spend an hour or two going through your drawers and cabinets to identify what you really use, what you can throw away, and what you can donate. If you haven’t used that small appliance in the last year, donate it. If you didn’t even realize that magazine clipping was in the junk drawer, pitch it. Keep only the things you really use. Step 2: Find a place for everything. When all your kitchen supplies have a designated spot, you’ll always know where to find them; saving yourself time and frustration. But that doesn’t mean storing everything on the kitchen counter. We’re not looking for clutter. We’re looking for organization. If it’s not something you use every day, find a spot in your lower cabinets or the pantry to store it until needed. If you rarely use it, but just can’t part with it, find a spot on a shelf in the garage, your storage room, in the basement, or a closet. Put items near where they will be used. Put the pots and pans next to the stove. Store your glasses near the fridge and/or sink. Keep plates near the silverware drawer. Make sure your oven mitts and pot holders are within reach of the oven. 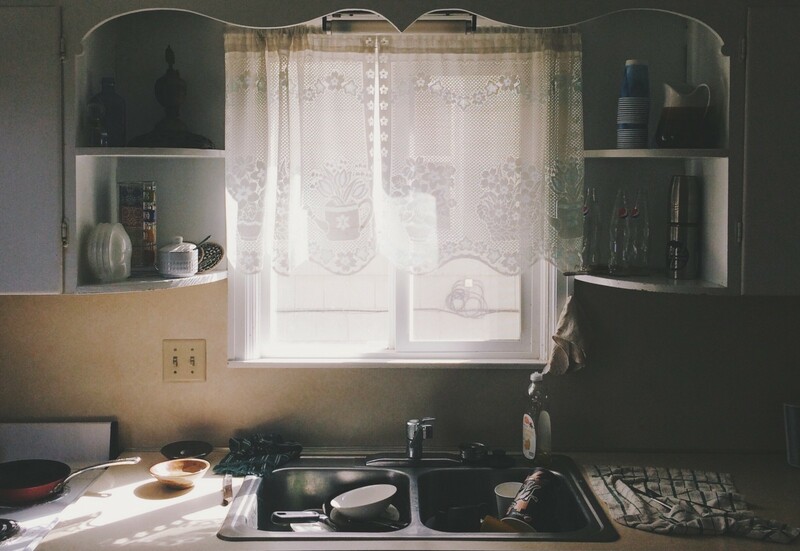 Make sure you don’t have to walk all over your kitchen to get things done. That may add steps to your fitness tracker, but it won’t help you be very efficient in the kitchen. 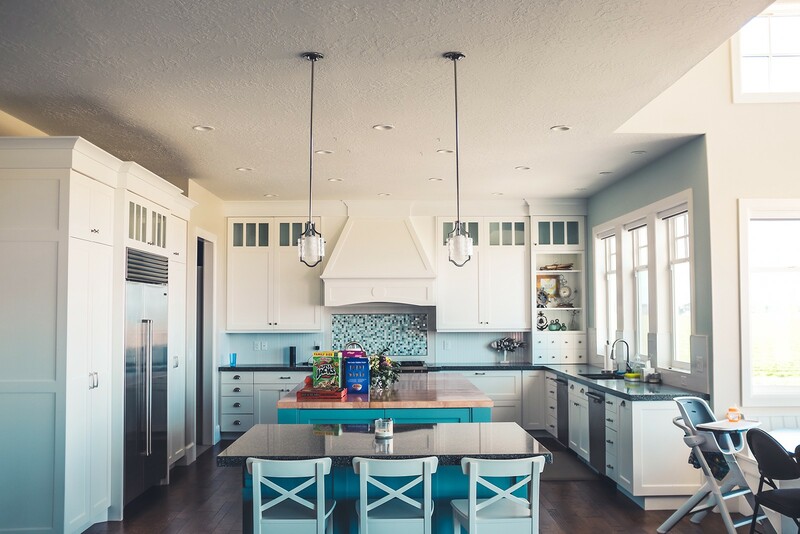 Step 3: Find space saving solutions.Whether you have a small kitchen or a large kitchen, space saving solutions keep your organized and reduce clutter. Storage Theory has several space saving solutions to keep your kitchen clutter-free. Use the Power Perch to keep your voice-controlled speaker, mobile phone, or tablet off the counter while charging. It looks sleek and works with your existing outlet so you don’t need to add any additional holes to your wall and you can keep your electronic device right by the outlet. Reduce the clutter on your kitchen counter tops with a Power Perch outlet shelf. 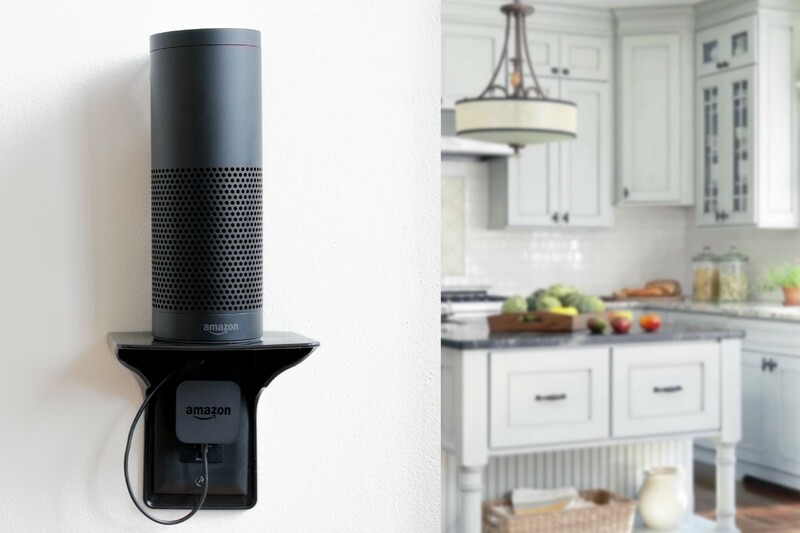 This space saver keeps your phone, tablet, Amazon echo, or other small electronics off the counters while charging. You’re day may not start until you’ve had your first cup of coffee, but where do you keep your coffee pods? Are they thrown in a cabinet or drawer or organized neatly next to your coffee maker? Our Cafe Wall Caddyallows you to keep your k-cups on the wall right next to your Keurig. And it uses your existing outlet for damage-free installation. All your favorite flavors will be perfectly organized and visible for you each morning. Cafe Wall Caddy stores all your Keurig K-Cup right where you need them; next to your Keurig. 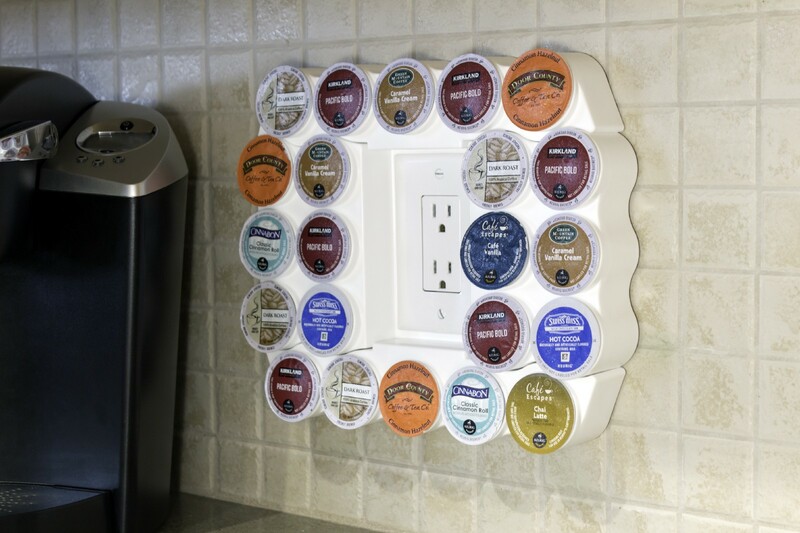 Save counter space in the kitchen or office and keep you k-cups easily accessible and displayed on the wall. Keep you Scrub Daddy sponge off your counter and use The Sponge Caddy* to store it on the side of your sink. You’ll never lose it again and it will always be in reach when there’s a spill or you need to clean off a plate or the counter. 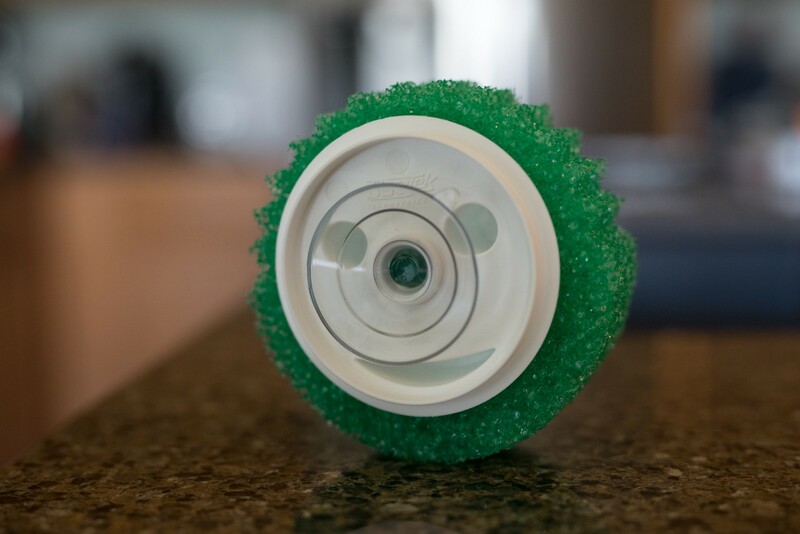 The Sponge Caddy stores your favorite smiley sponge within reach whenever you need it. Keep your wet sponge off the counter and instead suctioned to the side of the sink or tile. Use these and other space savings solutions to keep your kitchen space organized and clutter-free. Step 4: Google DIY ideas. There are a lot of really useful DIY hacks to keep your kitchen organized. Place spices in jars and attach them to cabinet doors or the side of your fridge with magnets. Hang your measuring cups and spoons from small hooks or double-sided sticky strips. Skip the knife block and hang your knives on a magnetic strip instead. Use baskets or bins in your pantry and fridge to store items together. Add a tension rod under the sink to hang cleaning supply bottles and save shelf space. There are a ton of great DIY tips on the internet. Scour Pinterest for organization and storage hacks and you’ll find a plethora of ideas to keep your kitchen organized. Step 5: Find a little time to clean up every day. Now that you have everything organized, keep it that way. Spend 10 minutes every night before bed making sure all supplies are back in their place and counter tops are clean and free of clutter. An organized kitchen allows you to save time by being more efficient. Plus, you’ll have a great space to enjoy meals with your family and friends.